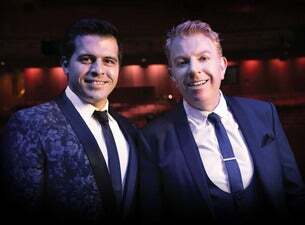 On the back of his triumphant tour in Ireland, Mark Vincent is back in Australia to premiere his first Melbourne Christmas concert at The Palms at Crown. Mark Vincent, will be accompanied by his eight piece band, showcasing the songs from his first Christmas album, ‘The Most Wonderful Time of the Year’. This young and acclaimed ‘crossover’ artist, with a sublime tenor’s voice, will perform a heart-warming collection of carols, including favourites: O Holy Night, White Christmas, Have Yourself A Merry Little Christmas and Silent Night. Mark will also perform his signature ballads and romantic arias, such as Somewhere from Westside Story and Nessun Dorma. With his smoldering matinee idol looks, irresistible charisma and a sublime once-in-a-lifetime voice, Mark Vincent will ignite the Christmas spirit in us all! Do not miss this concert by one of Australia’s favourite and most powerful voices, in his first Christmas Melbourne concert – be swept away in Christmas magic!! The iconic Palms at Crown resounds with seasonal cheer and carols, come and join Mark Vincent in Songs of Christmas; a concert experience that is not to be missed!